Frankfort Elks members delivered 35 gently used men’s coats, various other clothing items, and suitcases to the Veterans Clothing room at the Lexington VA on Leestown Road. This was fourth year that the Elks have partnered with the Kentucky Transportation Cabinet Employees “We Care” Coat Drive that is coordinated by Shannon Martin. 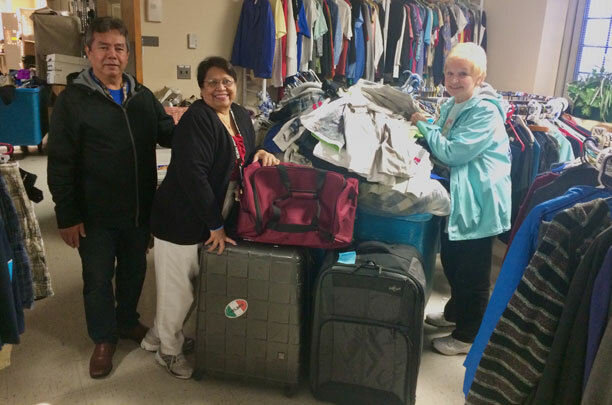 Pictured above from left to right are VA volunteer Alfredo Miranda, VA clothing room supervisor Ana Miranda, and Frankfort Elk Sandy Moore. This is just another example of how our members honor the pledge that Elks have made: “So long as there are veterans, the Benevolent and Protective Order of Elks will never forget them.” If you want to join in on our efforts to help our veterans, find out more about our lodge on our membership page, or talk to an Elks member about joining.